After a drought of sightings, I found two new stikmen around Boston! Last weekend, I was walking through Cambridge and found two new and very fresh stikmen who had not been there the week before. 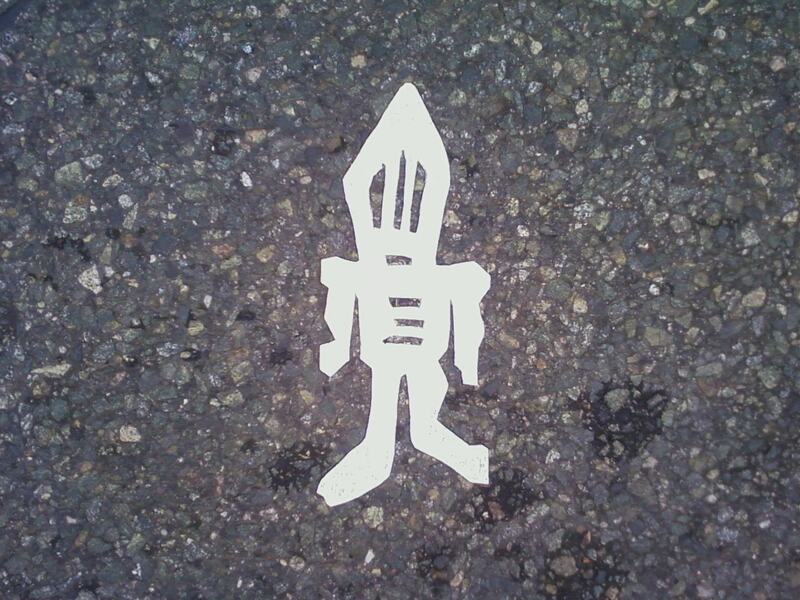 It was maybe 5 years ago in Washington DC that I saw my first “stikman”. 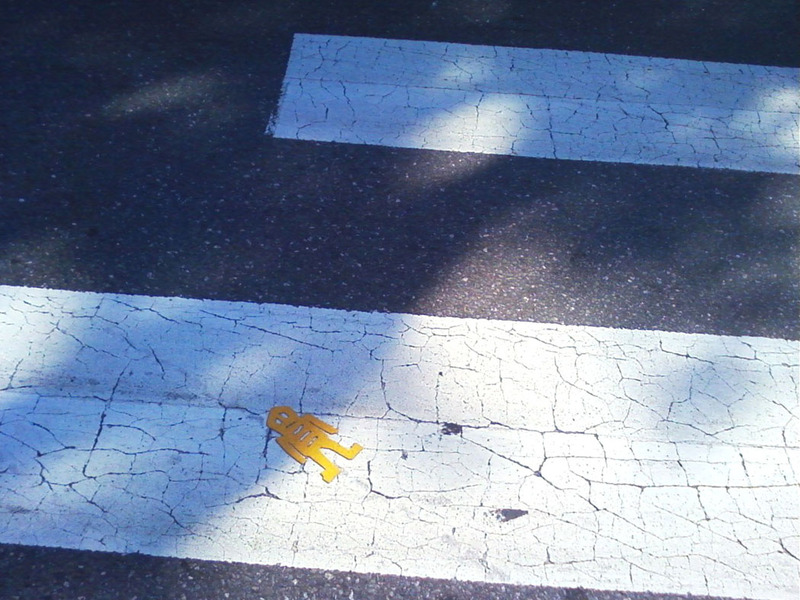 Stuck to the road inside a cross-walk was an 8 inch robot or alien looking creature made of white industrial vinyl. It was an interesting little figure, but I thought it was a one-off piece of street art. 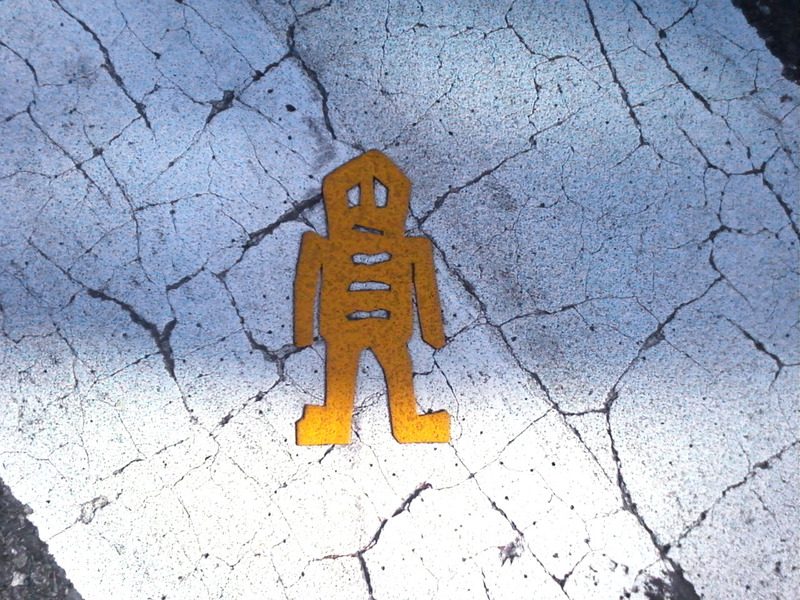 Then I started noticing stikmen all over – in Georgetown, in Dupont Circle, and down the National Mall. It seemed like a well coordinated but subtle urban art campaign. I assumed it was a DC phenomena because there were so many of them. (At the time, I missed this Washington Post article noting 150 stikmen in the DC area.) I was shocked to then spot more of these alien-robots in New York City, Boston and Seattle. Turns out stikmen have been found in Indianapolis, Toronto, and even Denmark! There is an extensive Flickr collection of stikmen sightings. The road stickers are just one aspect of the stikman project that was started 20 years ago. The artist “Bob” (who has remained anonymous throughout) had a solo exhibition at pandemic gallery in NYC this past Spring. The stikman project began with 3D stick figures (hence the name) affixed to city elements and has since branched out to stencils, hidden components in posters and, of course, the road stickers. After I first noticed the stikmen, I would mention them to friends or pointed them out whenever one popped up. No one claimed to have seen them before. I think that’s why I like the stikmen. They are right there on the road, thousands of people walk over them, and yet no one notices them. These awkward, but endearingly primitive little figures are silently watching city life go by. Over time, traffic and weather warps and wears away the stickers. While their degradation makes for some beautiful effects, it does mean that the stikmen don’t last very long. The first Boston stikman I found by South Station disappeared years ago. Maybe that’s why I am so excited to see some new stikmen in the neighborhood! So have you ever seen a stikman? Keep your eyes open; you never know where he’ll turn up! Never seen or heard of these “stikmen” before. Interesting! I’m not sure they’ve made it to Muscat yet, but let me know if they do! Who knew? I’m now on the lookout for them next time I’m in the city. I’ve spotted a lot more in Cambridge since I first posted this! I need to check out downtown Boston, but you can’t go more than a block between Harvard and MIT without seeing a Stikman! They are all over Downtown Oklahoma City! Just showed up about a month ago. My fiancee and I love finding ones we have missed and are new to us! A simple way to add a few smiles to the day! This is awesome!